A fun one-day celebration of books and reading – free to attend, everyone welcome, no booking required! 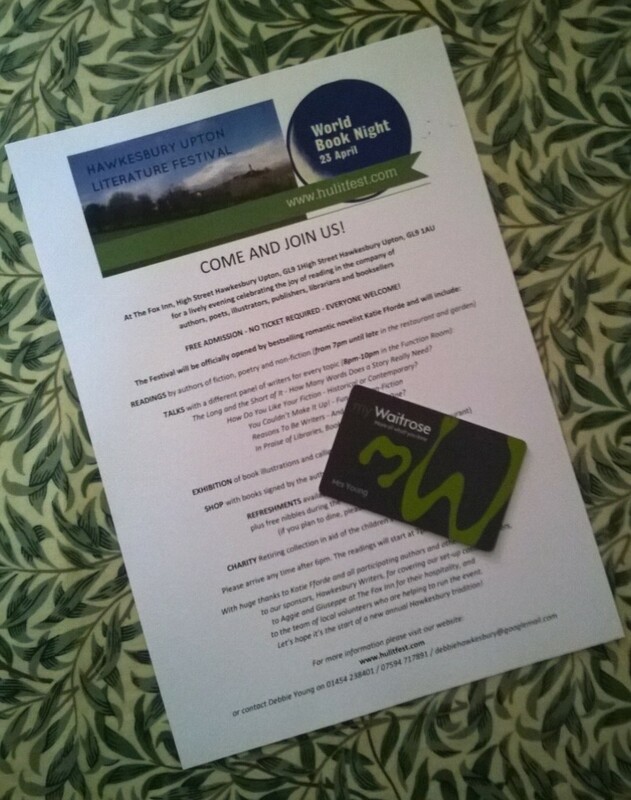 A new sponsorship offer from the local branch of Waitrose is helping the new Hawkesbury Upton Literature Festival keep its founding pledge to make the event entirely free to attend. Waitrose’s support comes as a welcome addition to the £100 seedcorn money donated by Hawkesbury Writers, the local group of social history authors responsible for the excellent “Monument to Hawkesbury” trilogy, and whose generosity has enabled us to cover the costs of hiring our excellent local venue, The Fox Inn. Throughout April, HULitFest will be one of the beneficiaries of the Chipping Sodbury Waitrose’s green token scheme. For those who aren’t familiar with it, this is Waitrose’s in-store system of supporting local community projects. A bank of three clear plastic boxes beyond the checkouts are allocated to different good causes each month, and all shoppers are given a green plastic disc as they pay for their shopping at the till – one token, regardless of how much they’ve spent. The shopper then chooses which of the good causes they’d like to support, and slips their token in the box. The store will consider any local group that completes the application form available from the customer service desk. At the end of each month, the discs in each of the three boxes are weighed, and £1,000 is split between the three causes in proportion to the weight of the discs. “It’s an elegant system that serves several purposes at once, raising awareness of local causes, generating significant funds, and encouraging those involved in each cause to lobby all their friends and relations to shop at Waitrose that month to support their cause!” says Debbie Young, whose previous career included a stint of PR in the retail sector. 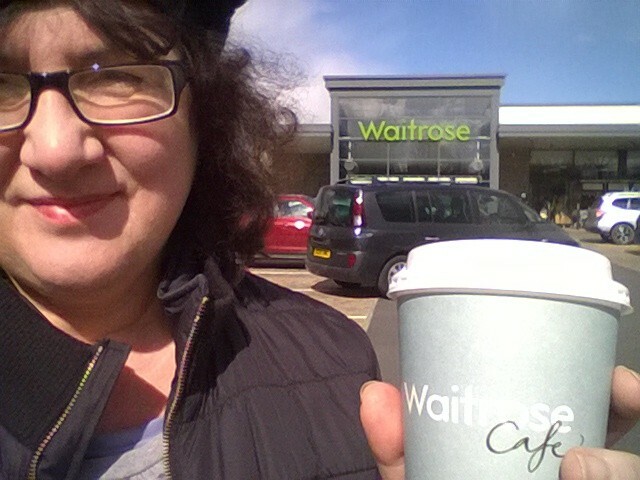 “As a regular Waitrose shopper, I’m thrilled to bits to be able to find yet another advantage of shopping at Waitrose – I’m already hooked on the free hot drink and paper that I get with every shop, as a “My Waitrose” cardholder, and I always enjoy choosing where to put my green token after each shop. The Festival’s collecting box will be operational from 1st April until 30th April, which means it will also provide a handy in-store advert in the run-up to the event. For details of the Chipping Sodbury store’s location and opening times, please click here. 🙂 I obviously miss out by shopping Ocado on-line … another down-side of being a city-girl! Wow! I didn’t even know there was a Waitrose in Chipping Sodbury, I have to trek all the way to Stroud if I want to go to Waitrose…ahem, however, the perks of living out in the middle of nowhere is that they’ve opened a small Waitrose just down the lane at St. Michael’s Wood services! Fantastic publicity and support there, Debbie, I don’t know how you do it!!!! If you have any spare posters btw, do pop into Tetbury Library, I’d love to put one up and try and publicise the event there too. 😉 Well done you!